New to SMS Marketing? No problem. We designed TellMyCell to be easy to use, but more powerful than any SMS marketing platform around. Want to learn more about Keywords? Click here for more info. Got a Facebook Page? See how to add our signup widget as a custom tab. Need help uploading your contacts? See our uploading guide. Still have questions? Give us a call or chat with us and we'll be glad to help you get started with your first campaign. Contact us now! There are three ways to manually add contacts to your TellMyCell account: Uploading a list of contacts, pasting a list of contacts and adding them one by one. 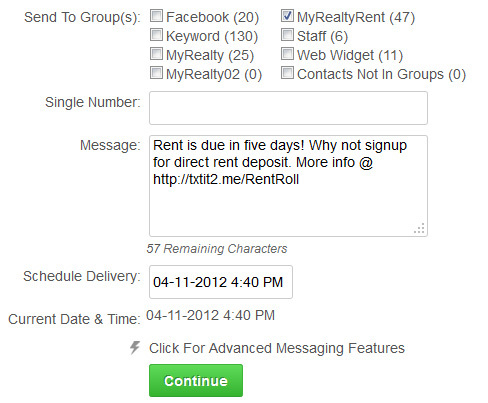 As you'll see below, you can also add contacts using Keywords and our Signup Widget. As you can see below you can add names to your contacts. Contacts that have a line crossed through them have opted out of receiving messages from you. You might have noticed above that chose to upload our contacts to the Group Employees. 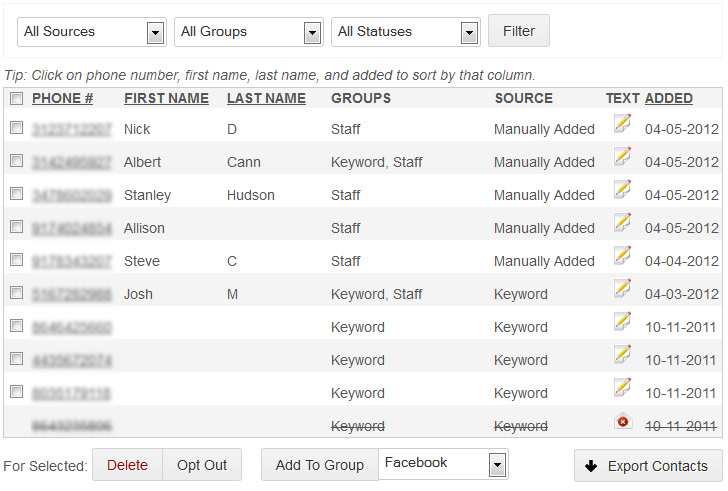 Groups are a powerful feature that allows you divide your contacts into segments. Each contact can belong to as many groups as you choose and you can create as many groups as you like. When you send a message you can select multiple groups. When you send a message you have a few options. First, select the Groups you would like to send your message to. Type your message - our character counter will let you know how many characters you have left. You have the option to personalize your messages and upload an image that we will provide a link to in your message. You can send your message immediately or schedule it to go out in the future. Text messaging is two-way. When you send a message your contacts may respond for up to twelve hours. When someone texts in your Keyword that message will be delivered to your Inbox as well. Unread messages appear bold. Keywords have many uses. 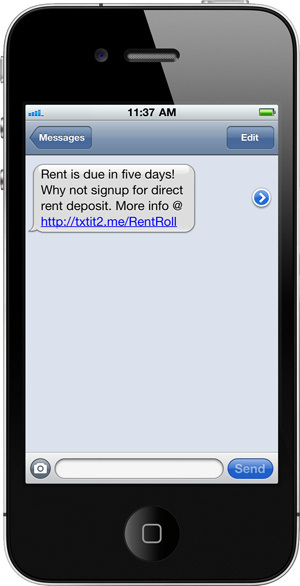 The primary use allows your customers or group members to join your list by texting your Keyword to our short code. Keywords can also be used to power SMS coupons, polling and contests. 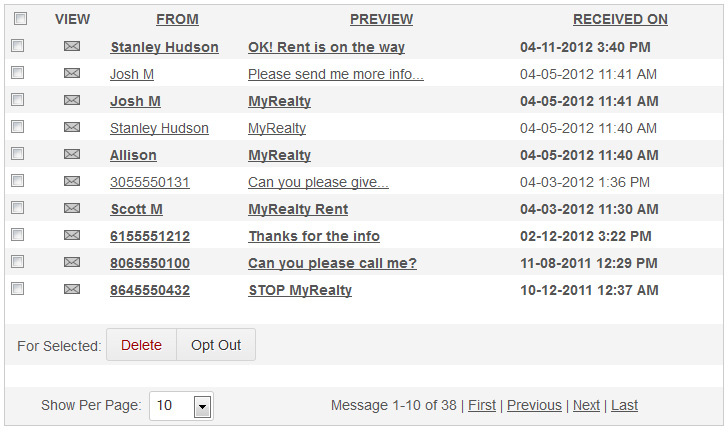 If you have a Keyword you can also send messages to your groups from your own phone, using our Send-From-Phone feature. In the example below, Jewelry is your Keyword. When your customers text in that Keyword we automatically send a response that you have set in your account and we add them to your contact list. Click to learn more about Keywords. If you have a website or send email blasts you create a customized widget to allow people to join your texting list by entering their phone number. If you send emails to your contacts you can add a link to the widget that we host for you. If you have a Facebook Page you can create a custom tab that allows people to join your list without ever leaving your Page. TellMyCell offers you two ways to pay. By default your account is set to Pay & Go. You can buy credits when you need them and rent Keywords on a monthly basis. If you buy messages in bulk we offer discounts. Credits that you purchase are called Anytime Credits and they never expire. Most of our clients choose to upgrade to one of our monthly plans. Monthly plans include Plan Credits and free Keywords. Each of our plans offers a different number of Plan Credits and free Keywords. There are no contracts to sign and you can cancel your monthly plan at anytime. If you are on a plan and you can also buy Anytime Credits at a discounted price. Please note: Plan Credits do not roll over. If you're logged in, click here to see available plans. Otherwise, check the pricing page. Need a custom plan? Contact us now. If you ever experience difficulties with your TellMyCell account we're here to help you. You can create support ticket in your account. When we respond to your support ticket we will send the response to your support Inbox and email you. You can also contact us via chat and phone during regular business hours. We've just covered the basics. If you'd like to start testing out TellMyCell go right ahead. Keep reading if you'd like to learn about some of our advanced features. Message forwarding is a great feature if you can't get to a computer. We can forward all of your incoming messages to any email address for free. If you'd like us to forward your incoming messages to a mobile phone number we can do that as well. In the screenshot below you can see that there is a third option - API, which we'll get to in a bit. Our Send-From-Phone feature allows you to text groups of contacts from your own phone. 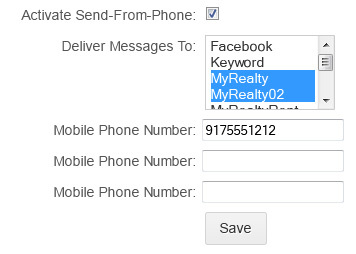 Send-From-Phone requires a Keyword, which you will connect to a group or multiple groups. You can authorize up to three phone numbers to send messages using a given Keyword-Groups connection. Sending messages is simple. 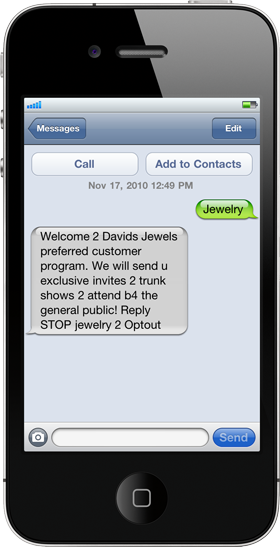 From an authorized phone number text our short code like this: "Keyword Your Message To Your Group". Whenever we receive a message like this from an authorized phone number we will automatically send that message to the selected Group or Groups. If you have an existing website or application you can easily connect to TellMyCell using our APIs. In addition to sending and receiving messages you can perform many account functions including renting and configuring Keywords and purchasing credits. To learn more about our API, visit the Developer Center for code samples, documentation and more.